This is a must watch creative oddity that may be giving us a glimpse of what’s to come as more people experiment with creating more music and robotic type interfaces. Jack White just set a record for the world’s fastest released record; recorded and released in 3 hours, 55 minutes and 21 seconds this past Record Store Day. Now Jack has announced an ‘Ultra LP’ for his upcoming release Lazaretto, a 12″ vinyl packed with a bunch of innovative bells and whistles that collectors will be sure to love. After a great teasing campaign about the evolution of Roland, today they have finally unveiled their new AIRA product line, giving the world famous, classic drum machines the 808, 909 and 303 an update into the future. 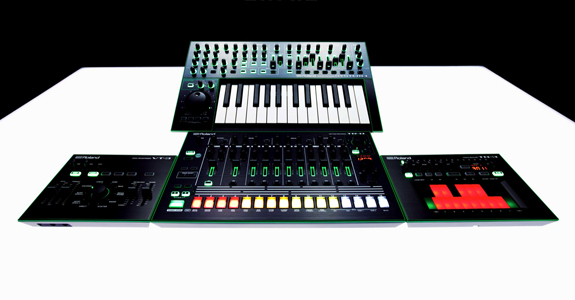 The first four products introduced in the AIRA series are the TR-8 Rhythm Performer, TB-3 Touch Bassline, VT-3 Voice Transformer, and SYSTEM-1 PLUG-OUT Synthesizer. These new machines are component modeled analog AKA Roland’s own version of analog emulation for today’s digital world. New studio performance video of producers Gorgon City and MNEK for their new track ‘Ready For Your Love’ forthcoming on Black Butter Records. Register now for NYC’s biggest audio technology event, IMSTA FESTA taking place on Saturday, September 28th at SAE’s brand new headquarters in Chelsea. This is our 4th year at SAE and all the previous years have been filled to capacity and tons of fun. Come hang out with top music technology companies such as Native Instruments, Ableton, Propellerhead, IK Multimedia, Akai, M-Audio, Steinberg, Cakewalk, Celemony + many more. IMSTA FESTA NYC’s largest audio technology conference is coming to the brand new expanded SAE NY campus on Saturday September 28th. Out to all the music creators…sound designers…musicians…composers…songwriters.. #freesamplefriday continues to hook you up on a weekly basis with free sounds, samples, tools and new experimental instruments. This roundup is a big one – packed with the last few weeks worth of goods. We’re back for another round of the best free audio tools around. Download these and get your music game up! In need of some new inspiration to get your musical ideas flowing? You’re in luck, here’s another installment of #freesamplefriday to get you through the week. If you’re in the NYC area come meet with us at Tekserve on Thursday May 9th for a special Ableton Advanced Users Meetup. RSVP’s are first come – first served!